In addition to the standardized Armed Forces Veteran plates, there are the following specialized veteran plates. Disabled Veteran Available to veterans who were at least fifty percent disabled while serving in the armed forces of the United States. Ex-Prisoner of War Available to any person, or to the surviving spouse of a deceased person, who was held as a prisoner of war by an enemy of the United States during any armed conflict. Gold Star Family Available to the surviving mother, father, step parent or spouse of a service member killed in an armed conflict with an enemy of the United States. Medal of Honor Available for any person who has received the Congressional Medal of Honor. 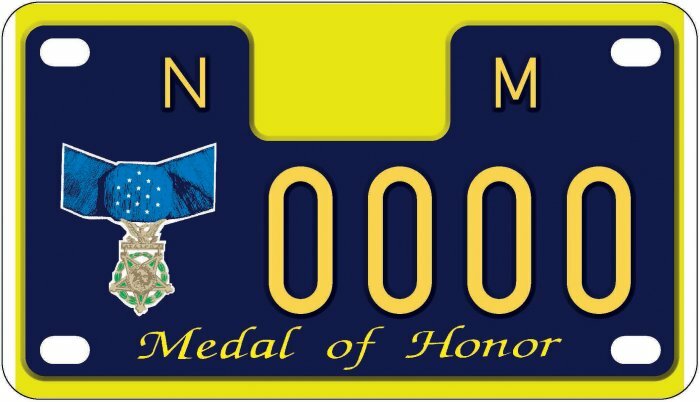 Fewer than a half dozen of these have been issued in New Mexico, though there are numerous Medal of Honor sample plates in circulation, bearing the serial number MOH*1. This special tag is also available as a motorcycle plate (see below). 1980s: Yellow background with red numerals. 1990s: Blue background with yellow numerals. 2000s: White-yellow-red background with black numerals. 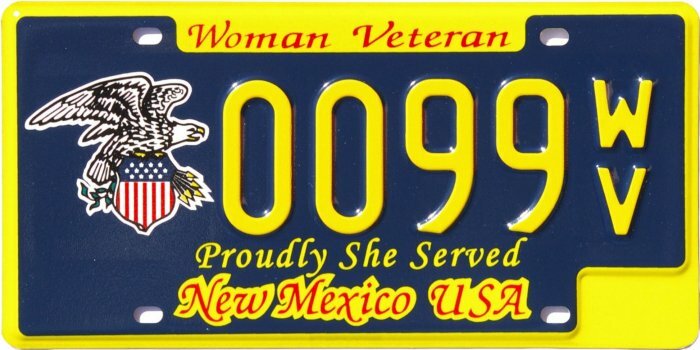 At present the National Guard plate is available to any person who is an active member of the New Mexico National Guard. Pearl Harbor Survivor Available for issue to survivors of the December 7, 1941 Japanese attack on Pearl Harbor. In addition to those who were in the harbor itself, all persons who were in outlying locations on the island of Oahu (e.g., Hickam Field) and those who were at sea but no more than three miles off shore, are eligible, provided that the applicant was on station during the hours of 7:55 a.m. to 9:45 a.m. Hawaii time that day. 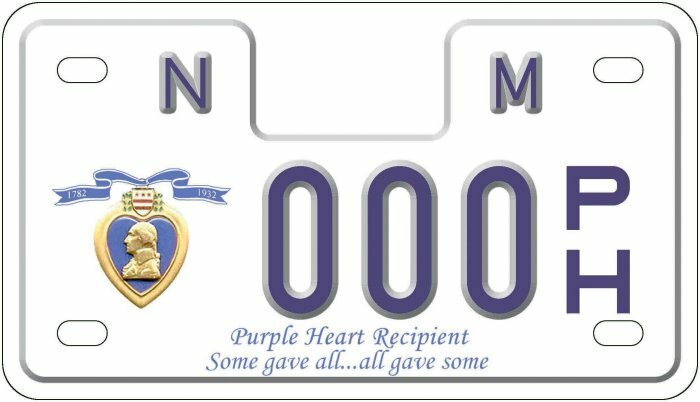 Purple Heart The Purple Heart plate has gone through at least three design iterations since its inception about 1990, and the current version may be issued for up to two vehicles to any veteran who is a bona fide purple heart medal recipient. This special tag is also available as a motorcycle plate (see below). Motorcycle Veteran Plates A number of types of Armed Forces Veteran plates are also available for motorcycles, but because of their small size the alpha suffix is not used, nor is there space for a veteran-designation decal. Photo credits: Motorcycle Medal of Honor sample and motorcycle Purple Heart sample courtesy N.M. MVD. All others by Bill Johnston.